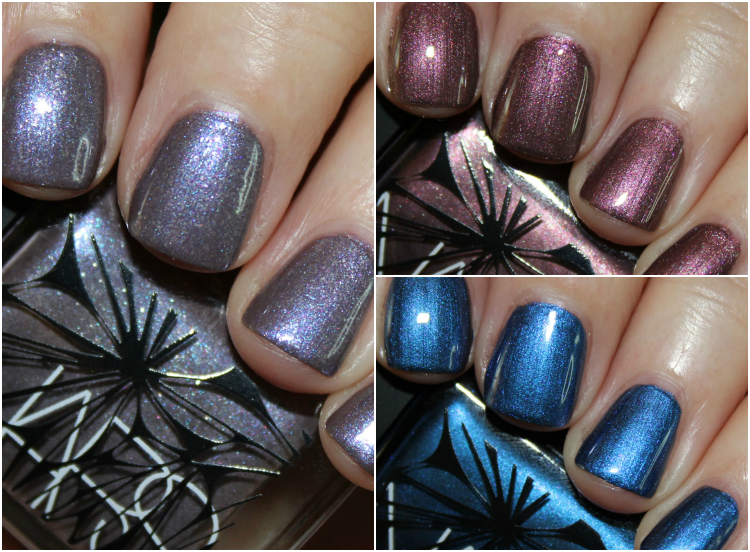 There are three beautiful new shades in the NARS Holiday 2014 Nail Polish collection, which comes out today. These don’t come in any ordinary NARS polish bottles though. The custom design on them is by architectural designer Chris Kabatsi. The print is a digitally-rendered Nebula print. The web-like black gloss on the front is his modern take on lace, and the bottle caps, which come off, have a soft, velvety feel. Sherwood is a violet rose shade with gobs of sparkles. I have no words. This is so beautiful and it took me by surprise too. It’s such a perfect plummy/mauve fall shade. The formula was really good, I needed just two coats and it was smooth sailing. Barents Sea is a deep navy blue with blue shimmer. Another really pretty shade, but I think this is the least unique one. This too had a really great formula though, and was just two coats. The NARS Holiday 2014 Collection will be available starting today on their website and select retailers November 1st. The must have ones in my opinion are Algonquin and Sherwood. SHERWOOD is cray cray beautiful. Truly. What do you think about these three lovelies? Will you be picking any or all of them up?